With over 160 years of experience, Dickinson & Morris is the oldest pork pie bakery in the Leicestershire town of Melton Mowbray. 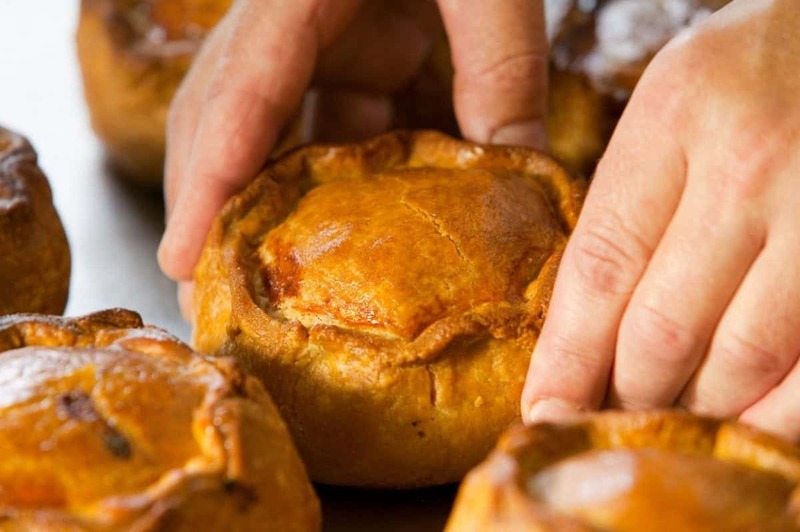 Having been baking their famous pies at Ye Olde Pork Pie Shoppe since 1851, the bakery is one of the few to produce the world-famous Melton Mowbray pork pie, granted Protected Geographical Indication status in 2009, using a classic hot water crust pastry and 100 per cent British pork. Now, the bakers have shared the recipe for their Melton Mowbray pork pie to make at home, with the help of a handy 12-step guide. Sift flour and salt into a warm bowl and rub in 15g of lard. Gently heat the remaining lard and water together until boiling, then add to the flour, mixing until mixture is cool enough to knead. Knead well to ensure no air is in the pastry. Keep aside a quarter of the pastry for the lid. Make the remaining piece of pastry into a ball and leave in the fridge overnight. Dice the fresh uncured pork into small pieces and season well with salt and pepper. Make the jelly at a later stage, whilst baking, by dissolving the gelatine in pork stock. Remove the pastry from the fridge at least two-three hours before making the pie case. Begin by gently squeezing / tempering the pastry ball between your hands so that it becomes pliable and mouldable. Loosely form into a flattened ball. Tip: take great care not to overwork the pastry. Using a floured surface, circle the pastry between your hands to begin bringing the wall sides up. Take your dolly, or if you do not have one of these, a regular sized jam jar, and push firmly into the centre of the pastry. This should raise the wall sides up and outwards, ready for shaping. Whilst rotating the dolly in a circular motion, squeeze the pastry with your hands and at the same time work the pastry up and around the body of the dolly. The pastry should have a regular and even thickness all the way round. Tip: make sure you do not push the dolly through the bottom of the pastry case! Raise the pastry to the top of the dolly and prepare to remove the dolly from the pastry case. Gently remove the pastry case from the dolly by teasing the pastry away from the sides with your thumbs. Slowly remove the dolly from the case. Firmly place your ball of coarsely chopped, seasoned fresh pork into the pastry case, moulding the sides to the meat to ensure no air remains in the body of the pie. Damp the inside rim of the pastry case with egg. Roll out the reserved pastry to an even thickness and cut out a circular lid. Place on top of the meat and pastry case. Seal and finish the pie by hand, gently pinching the lid and wall sides together. Top Tip: it is very important to ensure the lid is very securely sealed to the pastry case otherwise the sides will collapse during baking. At opposite points around the circumference of the pie push the sides in to create a crimped finish to the top of the pie. Chill the pie for at least one hour in a fridge, or for best results, overnight. Your pie will now be ready to be placed in the oven. Just lightly brush the top of the pie (not the crimp) with egg and make a hole in lid centre. Place on a baking tray, and bake in the traditional way – without a supporting hoop – to give a distinctive bow-sided shape to the walls. Bake in the oven at Gas Mark 4 (220°C) for approximately 1.25 -1.5 hours. (times will vary according to oven type and make). Once baked until a rich, golden brown, cool the pie, make two holes in the lid and pour in the jelly. Leave to cool further, ideally overnight, in a fridge. Remember the pie is designed to be eaten cold, not reheated. To enjoy the pie at its best, remove from the fridge at least an hour before consuming. Further information on Dickinson & Morris can be found at porkpie.co.uk.